Don’t Miss San Diego’s Event of the Year! 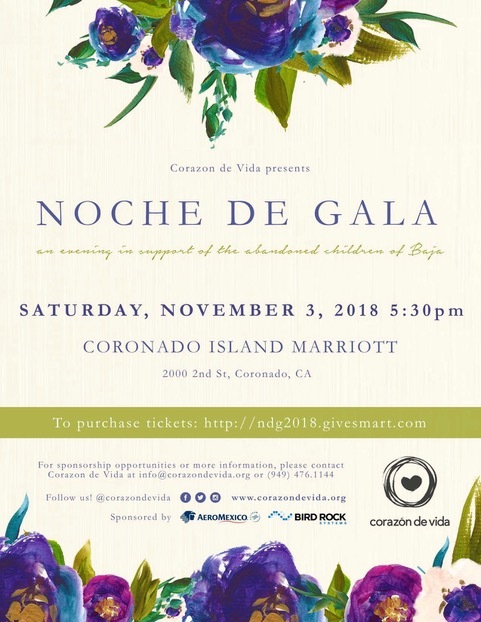 Visit the beautiful Coronado Island Marriott Hotel for an evening in support of the orphaned and abandoned children of Baja. Featuring a champagne reception, Mezcal and Baja wine tastings, a delicious dinner, live piano music, DJ and dancing until 11:30 pm! There will also be fantastic live and silent auctions that will include vacations, incredible experiences, dinner certificates, sporting events, and more! Founded in 1994, Corazon de Vida (CDV) is a US 501c3 non-profit organization providing life-changing support for orphaned and abandoned children in Baja, Mexico by funding local orphanages, providing quality of life improvement services and investing in the children’s future by funding continuing education. CDV provides consistent, monthly support to 10 orphanages. which provide a loving and secure environment for more than 500 children. Teens that have aged-out of the orphanage system are provided the opportunity to go to college or technical school (currently at 40+), giving them the tools needed to succeed in life. Corazon de Vida organizes monthly one-day chartered bus trips to visit the children, with pick-ups in LA, OC, and SD.